Hundreds of hard-line Buddhist monks in Myanmar protested on March 19 against a proposal to grant citizenship to the country’s persecuted Muslim minority, the Rohingya who are excluded from the Citizenship law of 1982. The demonstrations came after the Rakhine Advisory Commission, led by former UN chief Kofi Annan, urged Myanmar’s government to reconsider the ethnic group’s legal status. The government actually does not recognise the existence of Rohingya and rather considers them as Bengali. Stripped of their basic rights, community members have been submitted to extreme violence and atrocities in Myanmar. More than 87,000 people have been displaced since October. For years now, many have fled to neighbouring countries such as Bangladesh, where they live a life in limbo. State counsellor Aung Saan Suu Kyi has thus far remained silent on the issue. Bangladesh has some 32,000 registered refugees in two official camps located mainly in the Cox’s Bazar district bordering the eastern Rakhine State. An additional 200,000 to 500,000 unregistered refugees live in makeshift camps there, alongside locals. Having faced a continuous flow of Rohingya refugees for over two decades, the Bangladesh government is now planning to relocate the refugees to a remote island in Noakhali district, Thengar Char, about 250 km northwest of current camps. The government says the move would improve refugees’ access to humanitarian assistance. But Rohingya refugees reportedly oppose the plan, and human rights groups have urged the government to cancel the plan, which the Asia Pacific Refugee Rights Network has declared to be “dangerous, absurd and inhumane”. Rights groups argue that the island is uninhabitable: it rose from the sea only 11 years ago and is highly prone to flooding and cyclones. The Bangladeshi people of Cox’s Bazar and the Rohingya refugees share a common dialect and culture. As a result, law enforcement forces cannot always differentiate between refugees and locals. Despite restrictions on their ability to work, many refugees find employment in the informal sector, and some children go to local schools. The government has reluctantly allowed the refugees to stay so far, but it is clearly concerned that such opportunities will lead to integration. Thengar Char is a remote island in the most literal sense. The nearest sub-district office, Hatiya, is two hours away by boat. The surrounding areas are poor and underdeveloped. For the government, it is easier to manage a refugee population that is concentrated on Thengar Char. Locals there do not speak the same dialect as Rohingyas, decreasing the potential for integration. It will also be practically impossible for them to seek employment and education outside the camp. But the relocation would also make it very difficult for the UNHCR/UN Refugee Agency International Organisation for Migration and local NGOs to provide humanitarian services. 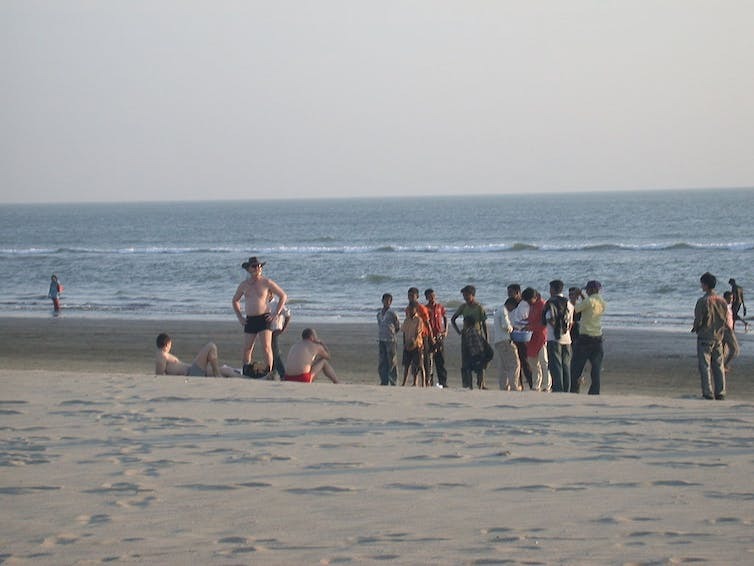 Currently, agencies are mainly based in Cox’s Bazar, a popular Bangladeshi tourist destination with the longest sea-beach in the world. It is well connected to Bangladesh and other parts of the world by land and air and offers staff the comforts of living in a city, including basic facilities and security. Thengar Char, on the other hand, is an exceptional place in overpopulated Bangladesh: it has no human settlement. Villagers who live nearby complain of pirates roaming the nearby waters, stealing goods and holding people hostage. The area’s security risks and remoteness may discourage humanitarian agency staffers from relocating there. The soil and environment of Thengar Char is not yet suitable for human settlement. The island is submerged in water during monsoon. Though it emerges during dry season, most of the island goes under water at high tide. Cyclone are of significant concern. According to a catalogue of tropical storms in Bangladesh, 193 cyclones struck the country between 1484 and 2009. Arguably the deadliest tropical cyclone in history hit the region in 1970, battering the coast with a six-metre storm surge and killing some 300,000 people. If even a small-scale cyclone hits the proposed Rohingya camp, a human catastrophe is nearly certain. The Noakhali district administration has written that the government would also have to “build flood protection embankment, cyclone centres and necessary infrastructure and ensure supply of drinking water” before receiving the Rohingyas in the Thengar Char. For the Rohingyas, current border camps in Cox’s Bazar are close to home not just culturally but also geographically. For some, crossing into Bangladesh is as easy as wading through a little creek on foot or taking a short boat trip. When Myanmar erupts in violence, many Rohingyas seek safety in Bangladesh, and, when it ends, some of them head back home. There is usually no asylum application, refugee-status determination procedure or UN-assisted voluntary repatriation; registration was last done in 1992. The country’s hundreds of thousands of unregistered Rohingya migrants live in limbo, as Bangladesh lacks specific refugee laws. During relative peace, many Rohingyas also cross the border to seek medical treatment, education, marriage, daily shopping trips, or to visit relatives. Some will embark on a secondary migration, heading to Saudi Arabia or Malaysia. Many of these practices likely violate Bangladeshi law, but they are locally accepted and have been going on for generations. Newly arrived refugees or migrants often get shelter and other assistance from relatives already living in Bangladesh’s camps. Many refugees in the camp also act as bridge between Rohingyas living in Myanmar and the diaspora of approximately one million others who live around the world. Bangladesh has been negotiating with Myanmar to repatriate the Rohingyas. Many Rohingyas in Bangladesh have expressed their willingness to go back to their homeland if state authorities can ensure their safety. However, the risk of persecution and violence in Myanmar remains high, and most refugees do not consider it safe there. International law requires that the Bangladeshi government only send back refugees who would voluntarily repatriate. If the alternative to life in Myanmar is banishment to Thengar Char, many Rohingyas might “agree” to return rather than face a dangerous and uncertain future on a remote island of Bangladesh. Previous articleAre converts to Islam more likely to become extremists? The Conversation Global launched as a pilot project in September 2016. The Conversation is an independent source of news and views, from the academic and research community, delivered direct to the public. Our team of professional editors work with experts to unlock their knowledge for use by the wider public.